The Baltimore Art + Justice Project recently sat down with artists, Ashton Page and Claire Fredrick to talk about their new exciting project, The Quilt Story Exchange. 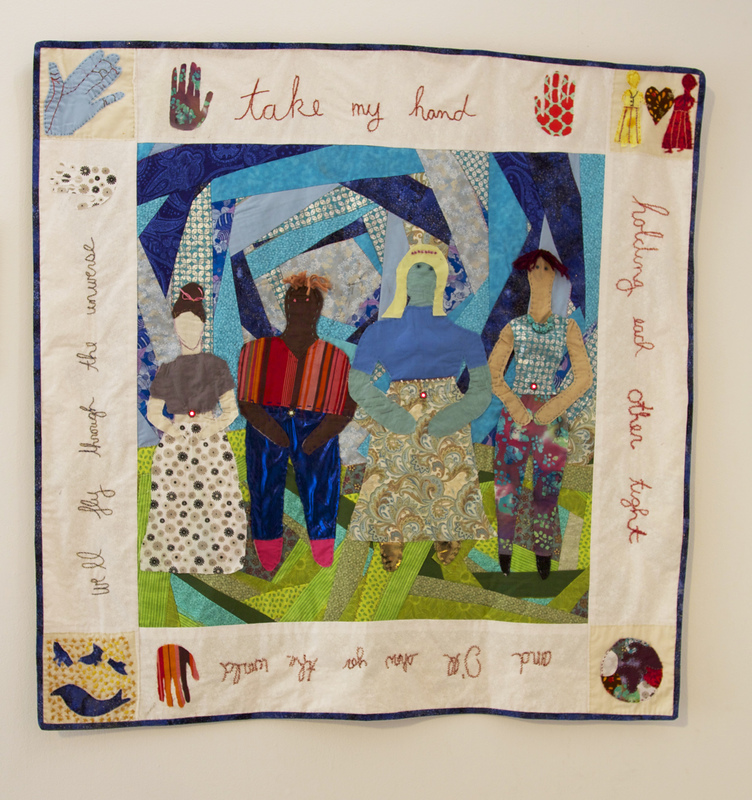 The Quilt Story Exchange will bring together groups of people, specifically groups of women, to create quilts that represent stories of trauma, hope, survival, and joy. Not only does the project give individuals a platform to share their stories, but the project promotes the independence of those who are or once were victims of trauma, by providing an in-depth experience with quilting and fiber art in emotionally supportive environments. As of now, The Quilt Story Exchange will work with four different non-profits in a year long timespan. Each different group of people will be given the opportunity to make one large scale quilt that represents their collective story of survival. The fifth quilt, our traveling quilt, will move between all four organizations, as well as our studio, and be added to. This collective quilt will become a narrative for many different survivors of trauma, which in turn will be displayed to the larger Baltimore community to offer spaces of healing and sharing. The Quilt Story Exchange is already at 11% of their funding goal of $10,000 but are currently fundraising for the rest. Donate, follow them on Facebook, and check out their profile on BA+ JP! Ashton Page & Claire Fredrick and we are the creators of the Quilt Story Exchange. Ashton: I live in Harwood. Claire: I live in Fells Point. Both of us work in many different neighborhoods in the City. We work in Remington, McElderry Park, Sandtown-Winchester and Upton, as well as East Baltimore Midway. We are both fiber artists seeking to use our craft as a conduit for strengthening communities. We use quilting as a method of storytelling, as well as a process for healing from trauma. Both of us came together with the intention of working with survivors of trauma on multiple levels. Here in Baltimore, this usually means folks coming out of recovery, specifically addiction, sexual slavery, street violence, living in poverty or coping from homicide. We wanted to address these issues that are ramped in Baltimore City and effect virtually all neighborhoods here. Both of us have had our fair share of traumatic experiences. We have lost friends and family. We both mutually agreed that to combat our grief and despair, we immersed ourself in the arts as a therapeutic process. Because it has been such a successful outlet for the both of us individually, we wanted to focus on healing arts as part of our collaborative project, in hopes of giving aid and relief to those effected by Baltimore crime and poverty. Dr. Joan Gaither and The Advocacy Project’s Advocacy Quilts. Joan uses quilting to share African American lineages of people and places, and has cultivated a large following of people excited about her work. To watch her run a workshop is truly a gift. In our journey to create the Quilt Story Exchange Project, Joan has acted as a mentor and teacher to us in this process. She has truly mastered the art of community quilting and we hold her in the highest regards. As for the Advocacy Quilts, they give groups of women in impoverished parts of the world the ability to share their story which is so often lost. We have found inspiration to do similar work, but instead of going out of the country, we want to stay in our own community and share the outlet that we have found works for us. The best part is that there is a great spirit of celebrating the arts here through local and grassroots levels. Whatever project you want to do to, there is someone out there to support you, and if you keep going in the same general direction more doors keep opening up. There is very limited funding, because there are so many people with so many ideas. It doesn’t help either that the population is saturated with artists. This saturation allows for a wonderful dialogue about artistic practices, but means there are more people wanting the same funds that you want. Womb Works. Definitely. There is just such a good vibe that comes from that group of people. It would be interesting to see if they would be interested in quilting a backdrop or something for a performance. Mother Made is definitely an inspiration. It is a true co-op based in Baltimore. We look forward to some day being able to use this method of social enterprise with our textiles as well. It would be amazing if the works we produce in this next year through The Quilt Story Exchange could also give the people we work with some financial gain. As two students coming out of the Maryland Institute College of Art’s MFA in Community Arts Program, we have both been exposed to a multitude of ways of introducing social justice topics into the arts /community arts realm. It seems that the best way to begin a dialogue with the community about social justice topics that are effecting neighborhoods is to integrate arts and creativity as ways of promoting safe spaces and open, honest discussion. From our perspective, it seems that organizations are becoming more understanding of the dire need for art enrichment and integration in their programming. Artists on the other hand are operating on multiple levels; as curators, authors, activists, organizers and businesses. In Baltimore, it seems that the dynamic of “artist” is shifting into a more complicated and multidimensional personality. You have to be more than just one thing–a painter or a sculptor–to be successful. Artists are becoming more community oriented are are operating on a amore local level, it seems we are all becoming more aware of social justice issues around us and rethinking how that shapes us and how it effects our work. To learn more, visit them on the BA+JP. And remember to donate to their awesome work!